What we learn is truly devastating, but it also shapes the true reality of Syria. Khaled, Amid Yousef, Mahmood and Ahmad are like Fantastic Four; together they are fearless against enemy’s bomb. As they fight against not only Bashar Assad, but Russian support as well, which like a clock bombs civilians by targeting larger groups of people. These four men do anything they can by leaving their loved ones behind, to put in line their own lives. Khaled said, “I am like a fish, I can’t live outside Aleppo the same way as the fish that can’t live outside of water.”. He says that when he buys a fish and leaves them in the ruined building, where he knows it will be still safe as it has already been destroyed. It will be really hard to watch LAST MEN IN ALEPPO, you should know that it’s the truth. I had to leave in the middle of the screening as I needed an urgent break after seeing all these dead people, devastation, and what we as human beings do to each other. You see, the issue is, the film captures painfully the truth about Russian bombings against civilians, while in the news they justify it as if they were bombing rebels. But there were no rebels. 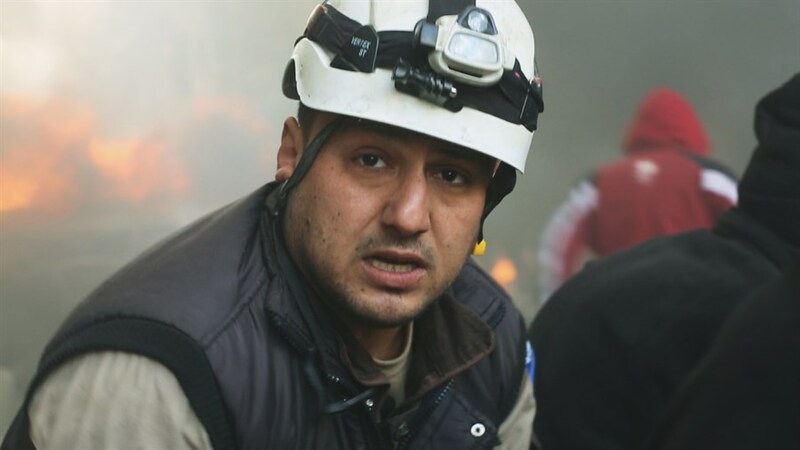 The director Feras Fayyad, who is risking his own life, follows those brave and fearless men who are willing to die no matter what, but to save people’s lives who are not rebels, all those who would attend a funeral every day to bury their loved ones. All of them wanted one thing only – to have freedom from Bashar Assad’s regime, to stop Russian bombings, and have a life they always wanted not only for themselves but for their family members as well. Khaled, you will hear, says another important thing, “We Arabs, are the worst. Because we do that against ourselves. All our Arab neighbors don’t care about us.”. And when you hear that, you do agree with him… While Dubai builds superb and fancy buildings, and Saudi Arabia controls the region, Syria is torn apart like nobody cares. Even though I always try not to be political about politics in any of my review, but with this film you will question that it’s not West or Europe who should rescue Syrians, but Arabians themselves… But the question is, why they don’t want to do that and why prefer to be neutral is a puzzle I wish someone will be able to solve. LAST MEN IN ALEPPO is a stunning documentary movie that with almost two hours of its running time will turn your mind upside down. It provides an essential viewing of a modern history of what humanity can do against humanity and how dangerous we as a species can be. As you will watch this sad, tragic and heartbreaking story, you won’t feel comfortable any more sitting in a cozy house with all necessary things to have your life fulfilled. And maybe right after, the first thing you will do is get up, go towards the window, open it and breathe a bit of fresh air, feel grateful to live in a country, regardless of where you are, where you don’t have to go through the nightmare the Syrians have to go through every day….